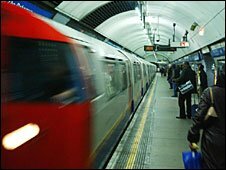 Fare evasion cost London Underground (LU) nearly £3m in lost revenue in the past year, a survey has indicated. Commissioned by security company G4S, it showed 3% of Tube users admitted deliberately evading buying a ticket. The survey of 2,004 adults showed that 6% admitted failing to pay for tickets for Tube trains and buses since 2004. A Transport for London (TfL) spokesman said: "There is simply no evidence to suggest that such a practice is in any way widespread on our network." The G4S survey found that 9% of adults using mainline trains admitted to fare dodging at least once in the past five years, with the cheating rate as high as 18% among 18 to 34-year-olds. The firm said one method on the Underground involved cheats pretending to put their Oyster card over the automatic gate reader. The honest customer behind then puts their paid-up card over the reader and the offender is able to pass through without paying. G4S director Steven Taylor said: "While criminal gangs use sophisticated techniques to clone tickets and try to circumvent card readers, thousands of Britons persist in sneaking through barriers to avoid paying. "These travellers are taking advantage of legitimate fare-paying passengers and depriving network operators of revenue that is vital to improve the travel network." But the TfL spokesman said: "We don't recognise these claims nor the basis on which they are made. "We take fare evasion extremely seriously and have a number of measures in place to ensure that it is kept to an absolute minimum." A spokesman for British Transport Police (BTP) said: "Of up to 3.5m passengers who use the Tube every day, the vast majority are law-abiding and do pay the correct fare. "BTP works closely with LU revenue staff to conduct more than 150 joint operations each year. "Fare evasion is a crime and anyone caught evading their fare can be reported for prosecution. "Those intent on not paying their fare will always look for new ways to avoid paying and BTP works with LU staff to both detect and deter this activity regularly."